Since 2002, SkillStorm has defined its own success by rapidly building & deploying teams in diverse environments along with steadfast commitment to Core Values. Success has been recognized through the growth from zero to $147M in eight years, by over 200 awards based on business ethics, rapid growth, recruiting excellence and employee benefits, but to us, our success is measured by the continual definition of our culture. 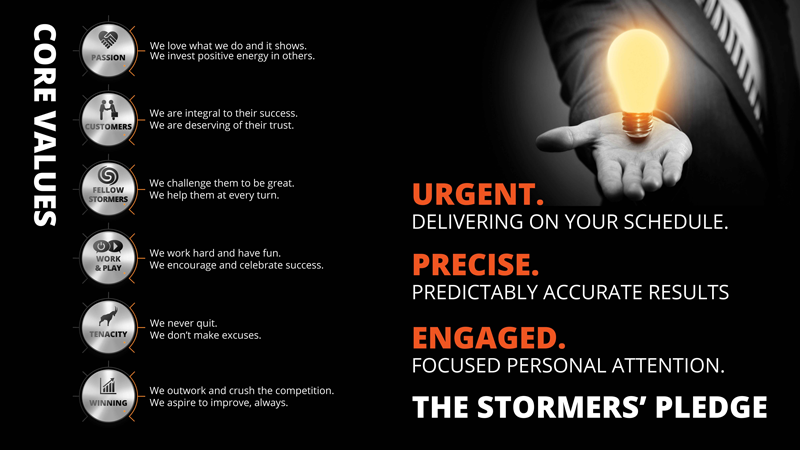 Culture is the reality of our experience here at SkillStorm. We recognize the difficulty of building true teams in our ever-changing, fast-growth industry and, as such, we live by the culture to ensure a tight-knit team regardless of location. It is one of the things that will always set us apart. How has SkillStorm defined its culture? With 1 purpose, a 3-part pledge and 6 core values.